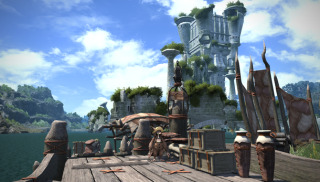 With Final Fantasy XIV: A Realm Reborn set for an August 27 release, it's time for those who haven't partaken in one of the MMORPG's closed betas to see a bit of the world they'll soon be frolicking in. Cast your eyes on that video above and you'll notice that A Realm Reborn couldn't look any more "Final Fantasy" if it tried. Set in Eorzea, the video provides a glimpse at some of the pretty realms in which you'll soon be grinding, providing you trust that Square Enix will make good on 2010's utterly botched outing. Hopefully they will. A Realm Reborn director Naoki Yoshida admitted in February that his team "took [it's] fanbase for granted. We lacked the knowledge of other titles. We didn't have the passion," he said . A Realm Reborn enters its last closed beta phase next month.